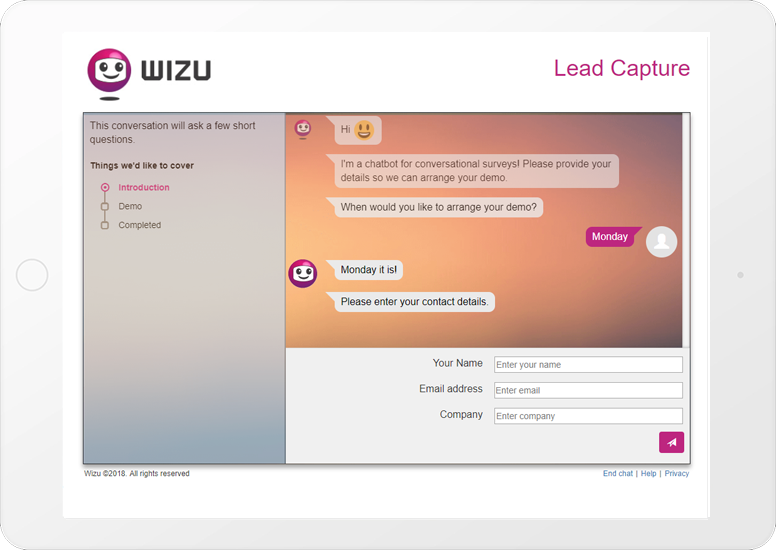 Wizu can be used for a wide range of scenarios from collecting customer feedback, market research, lead capture, employee engagement and more. Get in touch with us to arrange your personalised online demo to see how conversational surveys can help your business. Enter your details and we will send you an invitation to take this exact survey for yourself! Find out more about other use cases below. 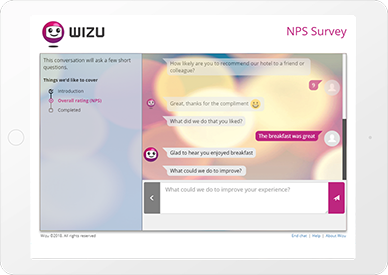 Wizu takes Net Promoter Score Surveys to the next level. Collect your score and gather follow up comments with our conversational interface to discover the reasons behind the score. 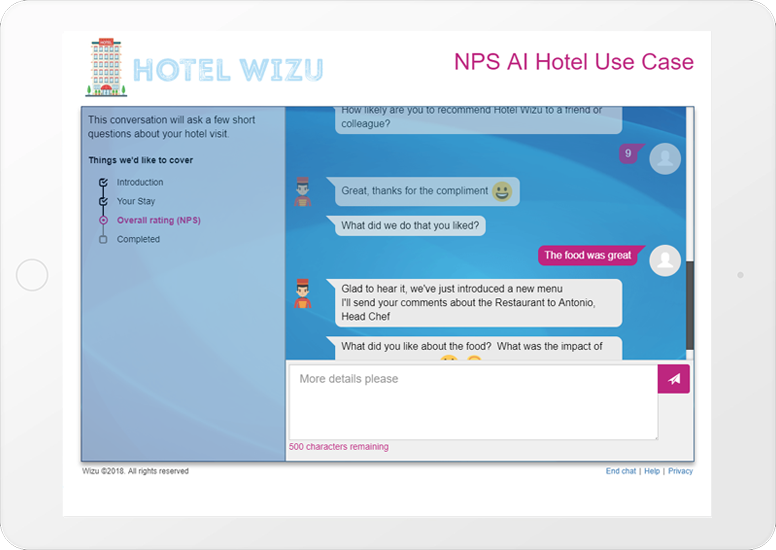 Wizu utilizes Artificial Intelligence to allow you to create engaging and intelligent NPS surveys. 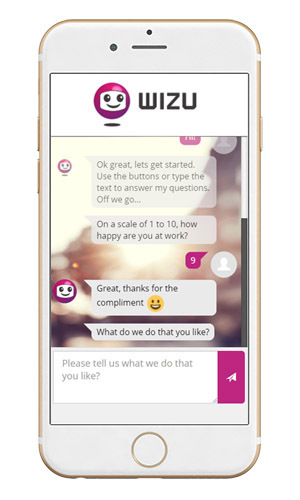 Wizu can automatically ask relevant follow up questions and probe into areas of interest, replicating a more natural human conversational approach. 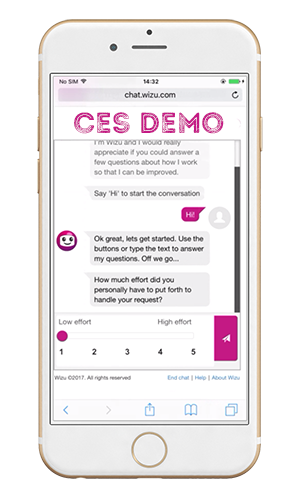 Measure and improve customer satisfaction through engaging, personalized and interactive conversational CSAT surveys. Choose from a range of engaging question types and add relevant reactions and routing to deliver and awesome survey experience. Wizu can help you identify pain points in the customer journey by talking to customers about how much effort was required at key stages in the experience and bringing you the data you need to make improvements. 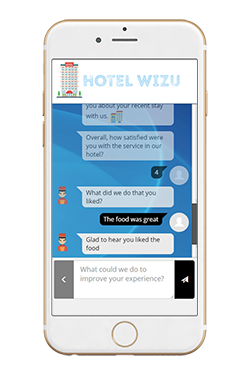 Employee Satisfaction surveys from Wizu allow you to engage with employees in a more interactive way giving you better insight into your staff and making it easier to keep employees engaged. 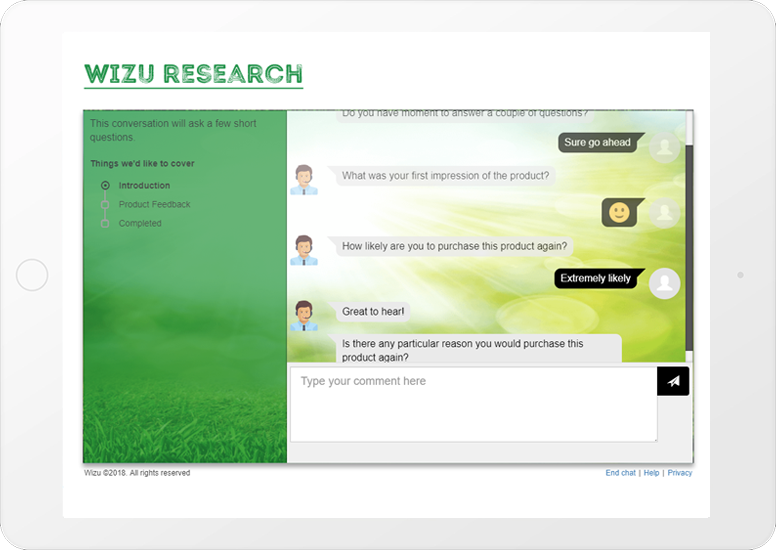 Wizu is introducing a new approach to market research through more engaging conversational surveys. Gather quantitative and qualitative data through our innovative methods to delivery truly interesting market research projects. Attract more leads through a conversational lead generation form. Gain higher conversion rates by converting your website visitors to leads through a more engaging lead capture form which can offer a more enjoyable respondent experience and help you gather more insight about your potential customer. Want to gather case studies from your customers in a fun and engaging way? Wizu allows you to collect customer stories in a totally unique way, allowing customers to tell their individual stories for you to better understand their experience. Wizu case study conversations also allow you to create shareable stories that you can use to promote your service and attract more customers. If you want to find out if your audience has enjoyed your event or perhaps look for ways to improve for next time around, then Wizu post event surveys will help you achieve this and more. Talk to your attendees to identify the areas they enjoyed most, any issues they might have had and gather feedback on everything from catering, speakers, location and more. All in a more personalized and engaging way.